At a time when the word "game" is likely to mean "video game" in the minds of many, the humble boardgame has been enjoying a renaissance of its own. Since the introduction of Settlers of Catan to the North American market in 1994, there's been a flood of European (mostly German) boardgames and a number of US companies are offering these designer games. Ticket to Ride, a boardgame about railroading and published by an American & French company, Days of Wonder won the game of the year award (Spiele des Jahres) in Germany and has since sold over 600,000 copies worldwide. The metro-Atlanta area has been a hotbed of boardgaming activity for a number of years. Numerous groups meet to play games each week throughout the metro area. The Atlanta Boardgaming groups at Meetup.com and Yahoo! are among their most active local groups. Fans of these boardgames from across Georgia and the Southeast will gather for three days of fun and games at the 13th Game Fest South is August 13-16, 2009 in Chattanooga, TN. The event brings social boardgame players mostly from across the Southeast to play the hundreds of boardgames available. There's a flea market in the afternoon where members will sell and trade old boardgames. "You won't find this variety of boardgames available for sale anywhere else in the USA." says Ward Batty, organizer. There's always somebody handy who is happy to teach the rules. So what is the appeal of these games compared to Monopoly or the other games most Americans grew up with? Says Ward Batty, "Players aren't eliminated. The games are shorter, generally from 30 to 90 minutes. While there is luck, players often have several things they want to do each turn, but have limited choice, so they must decide which is best. Players are usually competing more against the game itself rather than taking things directly from the other players. The aim of these games is not only to engage the players but create a fun social atmosphere." Memberships are $40 for four days. Families are welcome, but an adult must accompany children under 16. Full information is available at Game Fest South. The rules of Horse Fair Card Game could not be more simple. Cards are numbered 3 to 7. On their turn, each player lays a card before them. When there are as many of a card as that number, the horse wins and the player collects a horse figurine. Collect four horse figurines and win the game. Horse Fair is about horses winning blue ribbons. The horses have names like Sundown, Dandy and Rascal. The game takes fifteen minutes to play. The horse figurines are cute as can be. The response from a group of 20-40 year old men after playing was telling, "I really enjoyed Horse Fair, even though I'm not a little girl," one said. By all rights this should be a game that only an 8-year-old would love, but there is an x-factor of fun in Horse Fair that appeals to game all types people, and not just little girls. Players get to keep the cards of the horse that wins, so players find themselves talking up their horses, especially if they have more of that card. Soon players are exhorting others to back Snowflake over Firecracker. But the wise player will bow to the prevailing winds and play the card with the horse that will ultimately win. The gentlemen played several games, as each game is over once you have played through the deck, and takes 15 minutes or less to play. The publishers are planning a video for YouTube that will feature various players testimonies about the game and verifying that they are not, in fact, a little girl. They plan to bill the game as "Horse Fair, the game you don't have to be a little girl to love!" 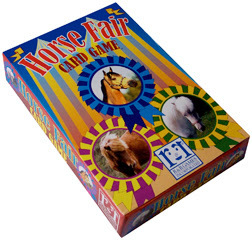 Horse Fair is published by R&R Games and Custom Game Co. I wrote a lengthy report on the Essen International Boardgame for the GamingReport.com. My first column for The Boise Weekly was a year ago and covered my favorite six games of the 2006. That makes this the second annual year's best games list, this time for 2007. Games are listed alphabetically and for the purposes of this column I'm using the North American release dates. This is a very interesting game which is, in theory, about making magic potions but is in reality a very interesting market game about making and selling different colored cubes. Creating a game about buying and selling with a viable market can be a tricky task, and Alchemist takes a clever and novel approach that makes for a very nice game. This is my favorite game of 2007. Players place buildings and surround those with workers that collect colored coins when the building is completed. This allows the player to adjust the market. The coins are worth how many you have to sell multiplied by how many of that color are visible in the central market. A novel game where each player tries to improve their section of Paris, support the building of Notre Dame and keep the plague-riddled rats at bay. It uses a great card-drafting system that originated in Magic the Gathering tournaments but has not been applied much to other games. Players take three cards, keep one and pass the other two to the player on your left. Then pick one of the two cards that have been passed to you and pass the other card. And keep the third card, so you end up with three cards from three players. Two of these will be played. A favorite type of game for me is a shortish game with tough decisions, a "meaty filler" as I call them, and even though there are no mushrooms in Portobello Market (it is a famous market in Britain) this is still an appetizing game. Players are building stalls in the market, trying to build in the most profitable locations. You can only build near where the bobby stands, but for money he will move wherever you want him to. This was named the Game of the Year in Germany and it is easy to see why. Players each have a zoo. Players fill trucks with up to three animal tiles and players select from these trucks. If there is room for the animal in your zoo that's great, but once you run out of space, animals are placed in the barn where they count negative points at the end of the game. This is a nice set-collection game with a theme that gives it universal appeal. This report originally appeared in ICv2 Guide #49--Games. We reprint it here, with space for more images. Editor and writer Ward Batty, who has over 30 years experience in retail management and publishing, sent us this report from the recently completed game fair in Essen, Germany. I wrote an article about the recent The Essen Internationale Spieltage for Gamasutra that you might enjoy. This is a site for electronic game developers, but as games like Puerto Rico, Settlers and Carcassonne move to that format, there is increasing interest in what's happing at Essen. As a freelance writer, one never knows where where work may come from. A case in point, I've been writing for the Boise Weekly. You can read my reviews here. I have thirty years experience in publishing and retail. In addition to this column, I co-publish Comic Shop News. I also have a company, Custom Game Co. that creates custom board and card games for companies and organizations.